Speaker of the House John Boehner (R-OH) will be resigning at the end of next month, after nearly 25 years in Congress and four years as Speaker of the House. As with most shakeups in Washington, fuckery is to blame. Boehner recently faced the likely prospect of being toppled from the speakership by members of his own party dissatisfied with his approach to the funding fight over Planned Parenthood. In his retaliation for his refusal to capitulate to their agenda, the far right faction of Boehner’s own party planned to vote the Office of Speaker vacant, which would have required Boehner to seek Democratic support to retain his office, according to NBC’s Chuck Todd. 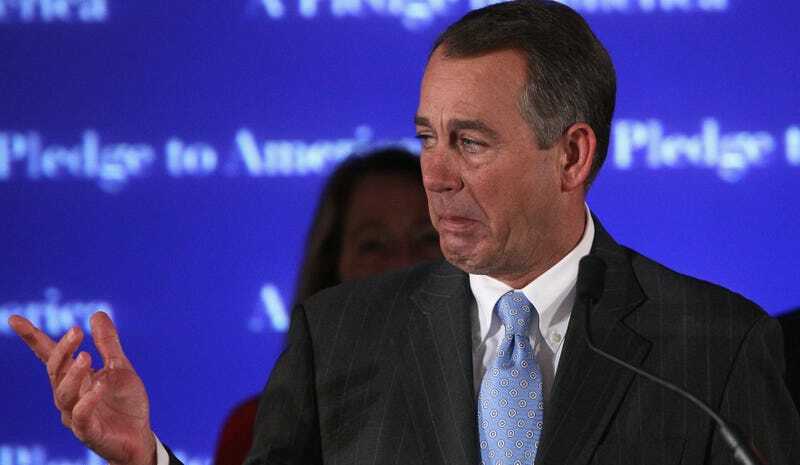 Republicans have been bandying about the idea of dethroning Boehner since 2011, just months after he became Speaker. No wonder the man cries so much. He has the most infuriating coworkers in the world. But non-Republicans shouldn’t rejoice just yet. NBC’s Todd added that frontrunners to replace Boehner as Speaker include Paul Ryan of Wisconsin and Jeb Hensarling of Texas. Look forward to a lot of men yelling about abortion for the next several weeks.